Aside from several engagements during the Hundred Years War, there were probably few large-scale battles in medieval France. 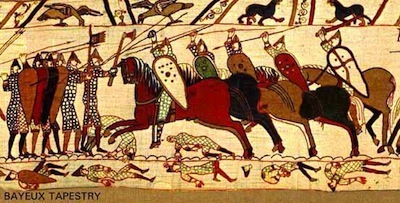 With an evolution toward centralisation of military and political power, the growth of battlefield and siege techologies, expatriate experience with crusade warfare, and a shift from the essentially protective to a more ornamental roll of the local knight in his shire, this was a period of change. People were interested in both the art of war and the art of chivalry. What they read was often a mixture of translated classical sources and purely vernacular, more functionally relavent ones. This page makes connections with manuscript facsimiles containing over 50 of both kinds. It is part of the Andy Holt Virtual Library's "Manuscripts of Medieval France with Vernacular Texts", a collection of over 800 links to manuscript facsimiles. MS Paris BNF fr. 5389 - 2 L'Arbre des batailles, par HONORE BONNET, prieur de Salon. etc. MS Paris BNF fr. 2063 [Anc. 7941] - Li Livres de VEGECE, de l'Art de chevalerie [jean de Meun), etc. MS Paris BNF fr. 142 [Anc. 6807(3)] - Logements de troupes, Garde de Régiments , Art militaire, etc. MS Paris BNF re, 146 [Anc. 6812] - Logements de troupes, Art militaire, etc. MS Paris BNF fr. 1968 - Art militaire, Armes faites a outrance, Livre des ordonnances et manières de combattre en lice, etc. MS Paris BNF fr. 2249 - Traité du comportement des armes (art militaire), etc. MS Paris BNF fr. 2258 [Anc. 8024(4)] - Art Militaire, Du comportement des armes, etc. MS Paris BNF fr. 5867 - Antoine de la Sale, Traité des anciens tournois, Journée d'honneur..., etc.